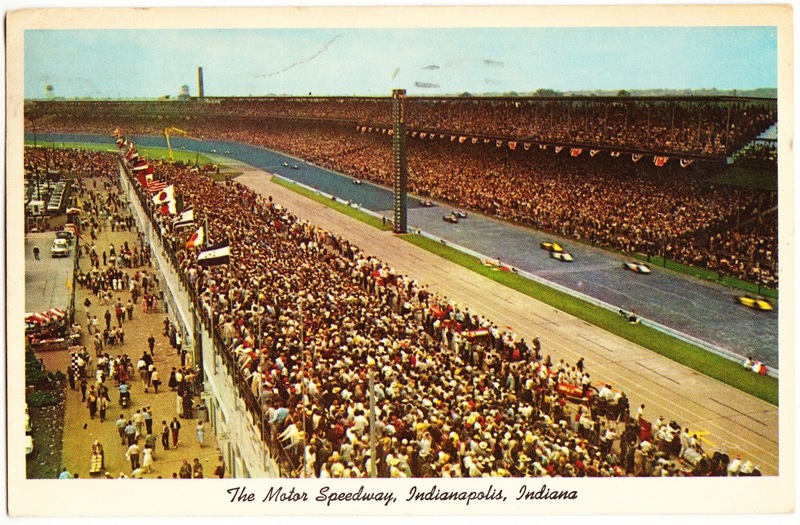 My great-grandmother, Greta Chandler Adams, mailed this postcard of Indianapolis Motor Speedway from Hammond, Indiana, to "Mary Margaret & Charles Ingham" (my mother and uncle) in Rose Valley, Pennsylvania. It's a timely post for this weekend, as NASCAR's Brickyard 400 is being held at this very speedway. "Save this card for I did not see this this time. Thought you might like to get this view — different! I am wide awake at 2:15 A.M. Sat. I drank coffee at Clark's hence wide awake! Sorry I did. Had good fried-chicken, you would liked it! Be good. Grandma." It's hard to read the date on the postcard. The card has a three-cent stamp, and that was the postal rate for postcards from August 1958 to January 1963, which fits the time frame I would have guessed for this card anyway.